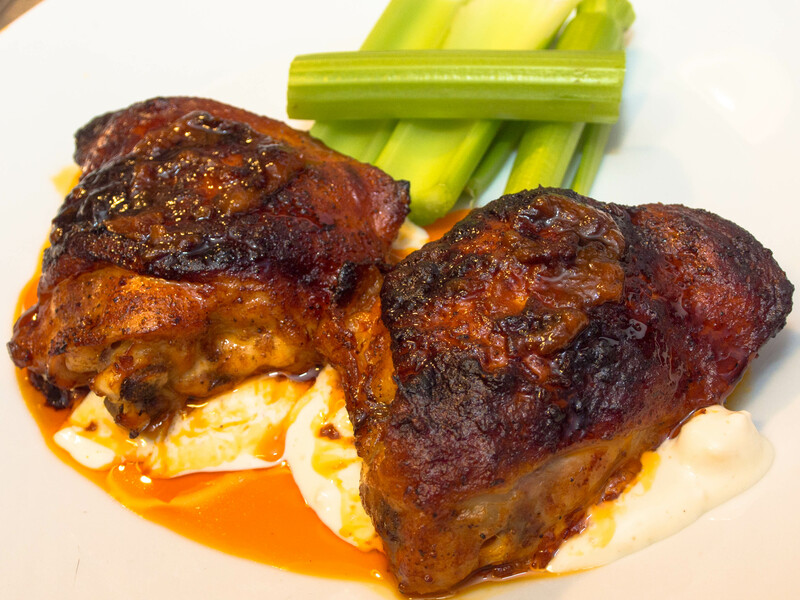 I’ve been working for awhile on a braised chicken thigh that was tender, but still had that crispy skin I love. I think I’ve come up with a recipes I like, so of course I had to try a Buffalo version of the Super Bowl. Preheat your oven to 350°F. 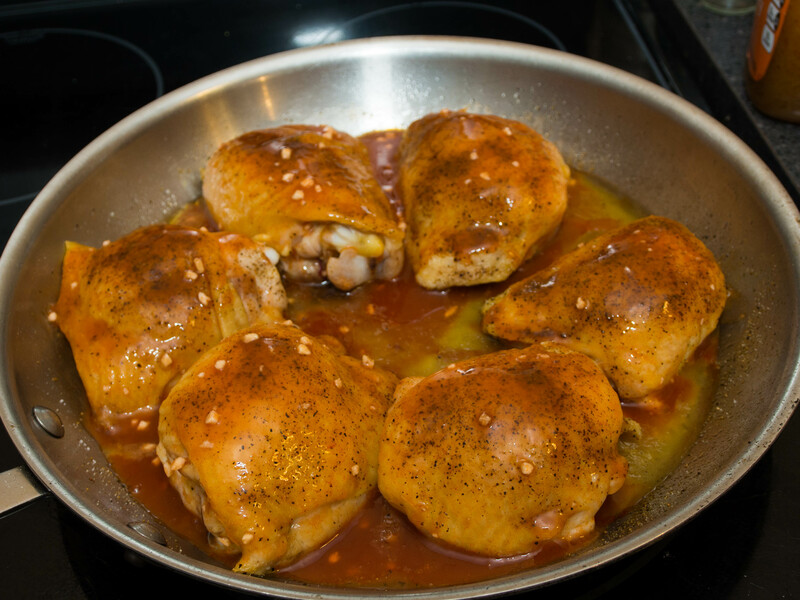 Lightly oil a 12-inch fry pan and arrange the chicken thighs in it skin side up. Season lightly with salt and pepper. Roast the thighs for 30 minutes, or until the skin has started to brown and crisp. While the chicken is roasting, make the sauce by combining the hot sauce, Worcestershire sauce, honey, garlic, and vinegar. Stir until the honey dissolves. Remove chicken from oven and pour the sauce over the thighs. Return to oven for 15 minutes. Remove the chicken and flip the thighs skin side down. Baste with the pan sauce and return for 15 minutes. Flip the chicken back skin side up, baste with sauce, and let braise another 15 minutes. Remove chicken and let rest 10 minutes. I plated the thighs on top of a dollop of bleu cheese dressing and topped them with a little pan sauce. The thighs came with a crispy skin and an almost fall-apart meat. The sauce wasn’t too spicy and had a good balance of sweet and tangy. The chicken juices gave the sauce a nice richness, but also cut the heat a bit. Next time I would hit it with a little cayenne. Looks really good. I’m going to give this recipe a try this weekend.